When you have a garden full of fresh, healthy vegetables but aren’t sure what to do with them, it may be time to consider canning. Canning has many benefits, both for your diet and your wallet. However, if not done properly, canning can be dangerous. The primary danger of home canning concerns the rare, but potentially fatal, disease known as botulism. Botulism results from a poison produced by the clostridium botulinum germ. This germ is naturally found in the soil and can grow and produce toxins in certain environments, such as improperly canned food. This toxin can negatively affect your nerves, causing paralysis and even death. When the toxin is present, you can’t smell it, taste it, or see it. However, it’s vital that you follow canning instructions exactly because even a small amount of the toxin can prove deadly. Any of these symptoms should be taken seriously and you should go to the emergency room as soon as possible for treatment. If you’re an amateur canner, it’s important that you find reliable recipes for canning step-by-step. You should also refer to the safety guidelines as outlined by the USDA for safe canning practices. Don’t skimp on proper canning equipment or instructions to ensure your food is safe to eat. It’s vital to use the right canning methods and equipment for preparing your fresh foods. Pressure canning is the recommended method for canning foods with low acid content, including most vegetables, certain fruits, meats, and seafood. This ensures the harmful bacteria present in the foods is destroyed properly. Follow instructions for setting up and using equipment properly, especially with pressure canning methods. You can easily be injured if the set-up isn’t done properly in the event the lid blows off and hot water spills on your skin. You should regularly check your canned goods for signs of damage. This includes looking for flaws in the containers including leaks or bulges. Check lids for broken seals or other damage. It’s not uncommon for lids to not seal properly or for people to twist the lid bands on too tight. This can mess up the vacuum seal that should be created as the gases try to escape the jar. You should also view the food inside, checking for visible signs of mold or discoloration. If any of these issues are present, you need to throw away the batch and clean up any spills in the refrigerator or on the counter with a bleach and water solution. This prevents contamination of other foods you prepare or store in the area. If you can see issues in your canned goods, such as mold or discoloration, never try a taste test of the affected foods. Even a small bite can lead to serious medical issues. 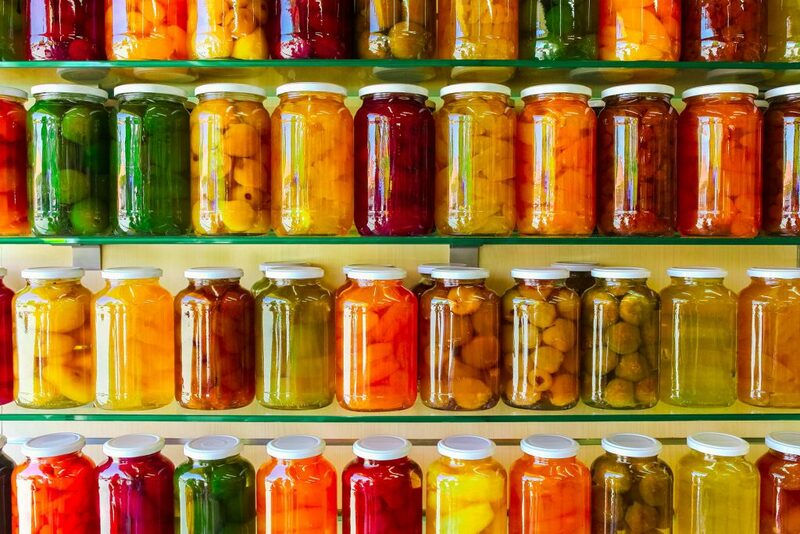 Overall, canning can be a safe and wonderful way to preserve your homegrown foods. As long as you use a trusted recipe and follow instructions, you can expect to produce healthy, toxin-free canned goods for your family and friends. To ensure you’re using the highest quality canning jars and lids, speak with a Bottlestore.com packaging expert to order the canning supplies you need. We even offer discount pricing on bulk orders.